Purple yams, ube, whatever you may call them, are delicious. Lately, my house has been inhaling these beautiful little sweet potatoes. Purple yams are best in their natural state, simply steamed and eaten quite simply. But of course, being me, I had to fiddle with perfection. Did you know that purple yams are extremely healthy too? They are full of vitamin C, antioxidants, fiber, potassium, and fat free! Well doesn't really matter much after you put it into this cake haha! But when eating them alone, remember all of these benefits! This is actually a new mochi cake recipe that I am using. My friend, Kim, modified her original recipe and gave me this delicious new one. 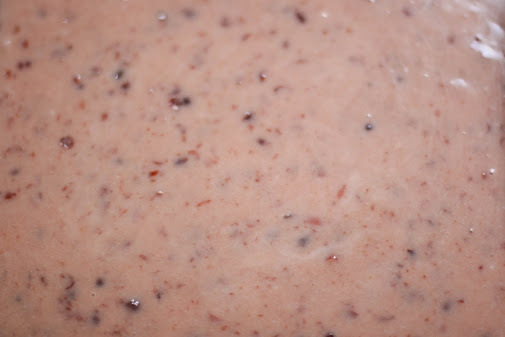 I simply just added some purple yam puree to it and called it a day. OH and I also made another red bean version, pictured below. To be honest, as beautiful as it might be, I was disappointed in this cake. It really had no discernible purple yam taste, which made me sad. But, despite this, it was still delicious as a mochi cake - so, do not expect ube flavor from this cake - just sayin'! Mmm close up of delicious chewy cake! Original recipe from my friend, Kim. Preheat the oven to 350 F. Mix the first 6 ingredients together until well combined. Lastly, fold in the ube puree until thoroughly combined. Pour into a large rectangular pan, cover with foil, and bake for 1 hour (usually takes a little bit longer). 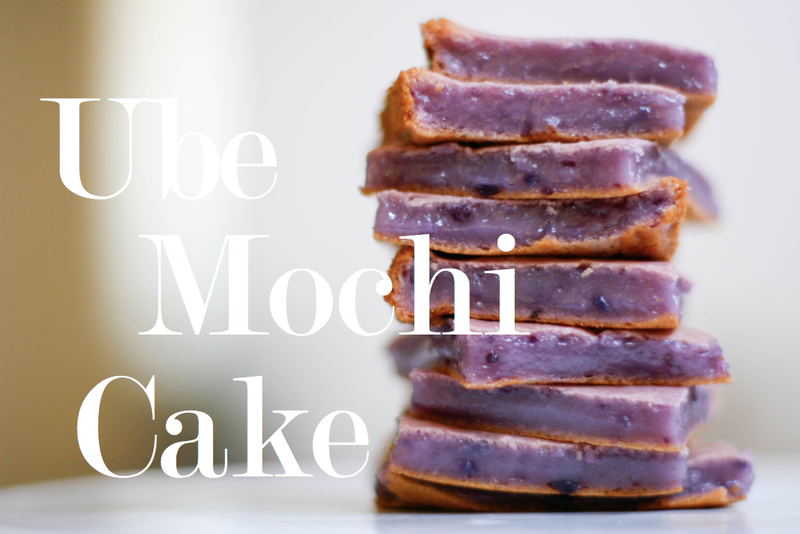 Making ube mochi has been on my to-do list for a while. It's interesting that your recipe does not require eggs, but that seems to solve the problem I usually have baking with ube (the eggs mixing with the ube makes the purple color disappear). I'm going to try your recipe out. It looks delicious! how unusual. i've never seen anything quite like that before. That looks amazing, I love mochi of any kind. AH! purple yams are delicious, i have to try this! Mmmm, those look delicious. 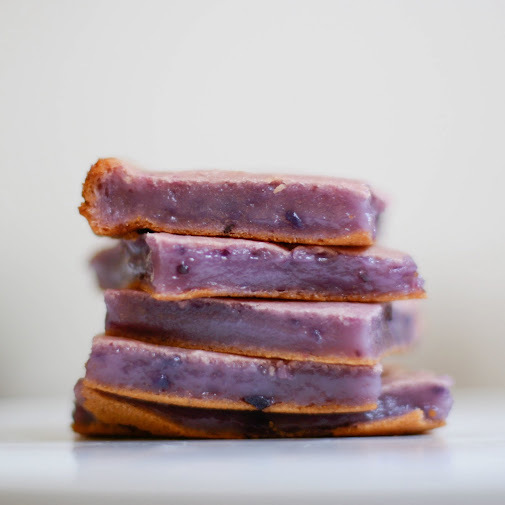 I love purple yams and have never seen them presented that well :) Glad to have stumbled across your blog. 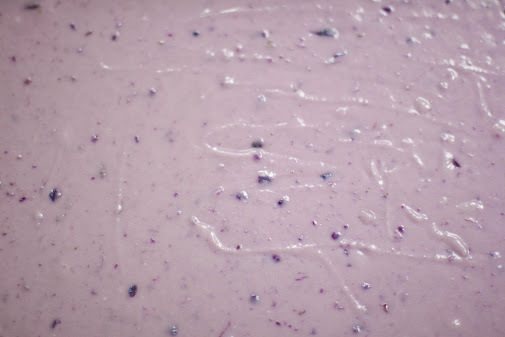 I'm a huge fan if ube and this is certainly a must-try recipe. Thank you for sharing!! Oh my... I am in love with your blog! Just found it about 10 minutes ago via foodgawker and I am in heaven. I'll definitely be trying this. I am loving these colorful mochi cake variations. 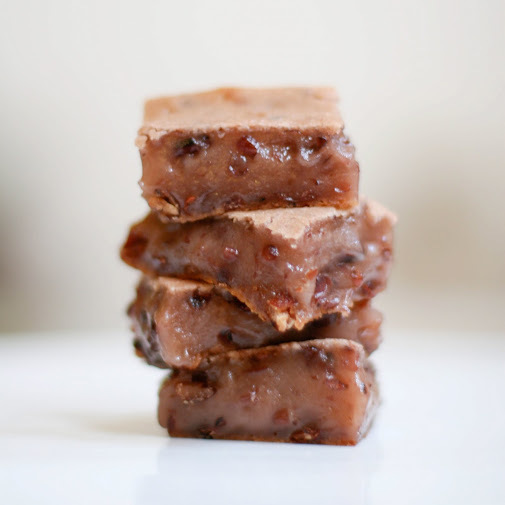 They look wonderfully gooey, just as all sticky rice treats should be. Never tasted a purple yam before but sounds like it's about time I do. Those cakes look wonderful, I can't wait to try the recipe! @ Julia: The box of Mochiko flour that I use is 454 grams/ 16 oz. @ Christina: I use a sheet cake pan or you can use a small square brownie pan, but if so, you have to use it twice! Hi. What size is the pan of the rectangular pan? Thanks. hi! how many cups or ounces is 1 can of coconut milk? thanks!!! what does covering it with foil during the making process do? What kind of milk do you use? Is it evaporated or whole milk?